The 70-Year Journey that Landed us Here! Frank B. Paules, founder of Crescent Industries, learned his trade of journeyman toolmaker at Pennsylvania Tool Company of York, PA. The Great Depression devastated Penn Tool and massive layoffs occurred including Frank. He eventually landed a job at American Insulator Company in New Freedom, PA as a toolmaker manufacturing thermoset and thermoplastic molds, fixtures and jigs. He earned the respect of his peers and supervisor and was quickly promoted to Research & Development Engineer. Summit Machine Works obtained military contracts to machine gun turret castings and helm column castings for the famous PT gun boats during World War II. By the end of the war, most military works dried up and their future looked bleak. His business partner backed out so Frank steered the company into another direction. This is when the Paules’ family renamed Summit Machine Works to Crescent Industries. This change signified a new beginning! In 1956 Crescent Industries became Incorporated! 2 years later, tragedy struck with the sudden passing of Frank Paules at the age of 51. The family rallied to preserve the business. His son Dean moved his young family and left his electronics career to join the business. Youngest son Daryl, after graduating from Johns Hopkins, joined as well. Established differential aptitude tests to hire young apprentices to become top-rated accredited journeymen mold makers. Over 30 apprentices have been trained in Crescent’s PA Approved Apprentice Training Program. In the late 1960’s Crescent purchased an old Watson/Stillman injection molding press. Dean applied his electronics ingenuity and led the fledgling molding department in reconditioning the machine. Crescent started to sample molds before shipment making them one of the first shops to sample new molds! This was a pivotal decade. Crescent purchased a Natco 225 Ton, 14 ounce modern injection molding press and built several 4-cavity, 96 well diagnostic Microtiter plate molds and started running production of these parts. This was the beginning of Crescent manufacturing products for the Medical Industry. Building additions were constructed for their new molding venture. They purchased four, 220 Ton presses and four VanDorn 75 Ton presses. Their first piece of automated equipment was also installed. Crescent decided to make some serious commitments these years. They began developing their world class quality systems along with a state-of-the-art manufacturing facility. In 1997, Crescent made the amazing decision to become an Employee-Owned Company and still are to this day! In 2001, after the horrific terrorist attacks on the World Trade Center and Pentagon. Crescent worked 24/7 in order to make respirator masks for the recovery and rescue teams on ground zero. 8 years later Crescent extended their manufacturing capabilities with another facility to accommodate Crescent Medical Plastics Division. Which followed by achieving ISO 13485 Certification. Crescent continues reinvesting and renovating their facilities to optimize their environments for their customers. 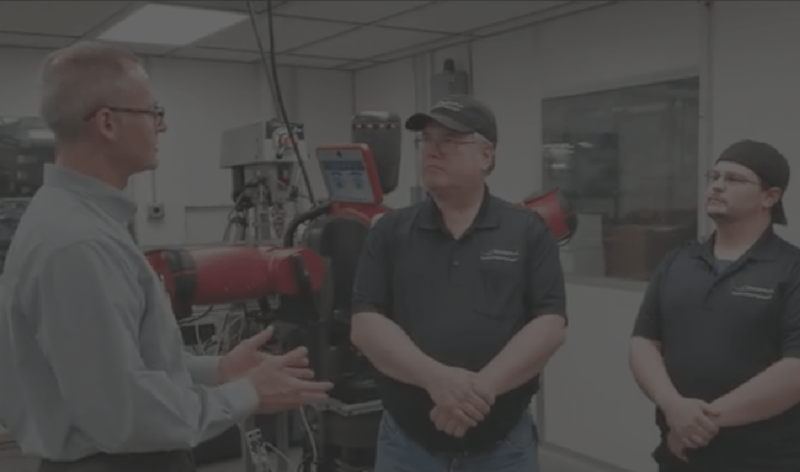 Purchased their first set of Baxter robots which sent them down the path of investing deeper into highly-automated equipment for their processes. Achieved FDA Registration in 2014. Crescent Celebrates their 70th Year Anniversary! Expansion on the horizon with recent acquisition of new property!